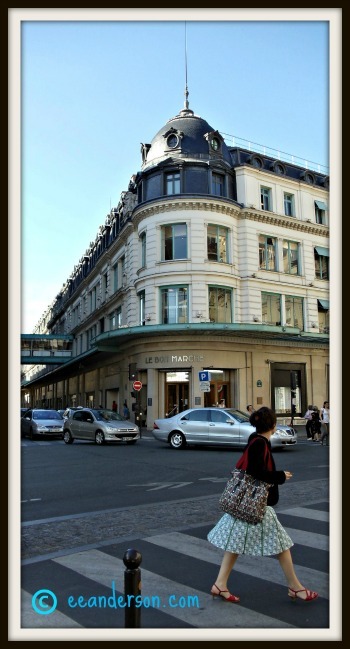 When I think about what to wear in Paris, France what comes to mind is Mary Jane shoes, some accessories like costume jewelry pearls are nice, a scarf or two. 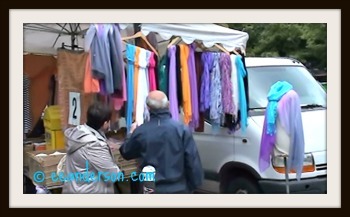 You can pick up nice inexpensive scarves at street markets. I got a really nice large purple scarf that I just love for 2 euros! Like always I start with my basic travel wardrobe then add and subtract. You can’t go wrong with a neutral wardrobe so that you can mix and match. Pack a blazer and pants a skirt a sun-dress a nice shirt and t shirts. Even though black is pretty basic for what to wear in Paris, check out current women's fashion trends. Get a few t shirts in this seasons colours, so you are not wearing all black. Paris weather can be unpredictable so carry a compact umbrella. I also have a hat that folds from e-bags in case the sun comes out as it can be very strong. If you go out to the outer arrondissements were there are more youth you will see this. What to wear in Paris becomes less important; however, if you are site seeing you should still cover your shoulders. Don’t wear shorts as it is disrespectful if you want to visit a cathedral. They do tend to wear clothes that fit and usually even poor students look put together. You may want to note that Parisian girls are more attracted to you if you dress nicely. Try to stay away from the sweat pants with the less dressy hoodies, really bright floral patterns, nylon windbreakers, crocs and of course, the American uniform. (Big white running shoes, logo t-shirts, shorts and baseball cap) Also, fanny packs stand out for pick-pockets and thieves. Maybe you eat all your meals at McDonalds! What to wear in Paris would be less important. Cafés are an addition to their homes so be polite. 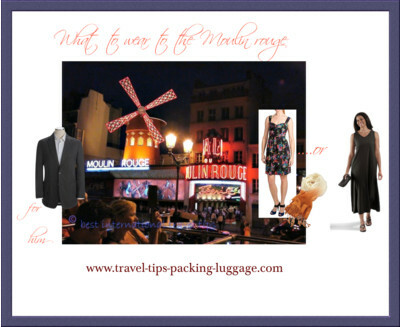 What if you want to Tango or go for that romantic dinner on the Seine, the Lido or Moulin Rouge. Have at least one nice outfit for going out at night or for dinner in a nice restaurant even if it is a pair of black slacks and a nice top. A sundress is nice with a flat or sandal. A flip flop will work but make sure it is leather or has some bling on it, not the plastic beach kind. Get a pedicure. Whatever kind of shoes you wear, make sure they are comfortable. If you Tango you may want to get a new pair of dance Shoes. Maybe white or cream as it can get very hot sunny and humid. They have man made beaches along the Seine now, so you might like to take some sun-bathing items. If you will have time for this activity. I found that when I left for the day it was easier to wear shoes and clothes that would get me into a decent restaurant without having to run home and change. They buy what suits them personally, the best they can afford with good quality, and simple well fitted cuts. You will see a lot of black and neutrals. If you think of what to wear in Paris try lots of shades of grey. They tend to look neat even just to go shopping. They are always very well groomed and flawlessly put together. Remember they are going to work or out for lunch etc so tend to dress more conservatively. On week ends it is more smart casual. They are embracing jeans a bit more especially on week ends when visiting art galleries and museums for instance. They wear black or indigo jeans more structured and even ironed. They dress a bit understated. They tend to like the softest cashmere sweaters and tie them over their shoulders when not wearing them. If you wear prescription glasses get a nice up to date pair and rest your eyes from wearing contacts all the time. Get some designer looking sunglasses also. You will need something to carry your days shopping. I like the Longchamp's Pliage fold up tote. I also have some zippered fold up bags you can put in your purse. Boots are a real fashion statement. They are wearing a lot of leather in the cooler weather and a simple coat like a black, brown or camel pea jacket. Personally I don’t travel much in cold winter climates so I find it easier to layer if it is chilly. I have a black trench coat that is part of my basic travel wardrobe and it worked well in Paris. They seem to look great even if just wearing a blazer and slacks and a scarf. I think it is because they take care that they are coordinated, and have great posture and exude confidence. As much as what to wear in Paris. French women tend to keep it simple and natural looking rather than made up with coiffed hair. They take care of their skin from an early age. They do wear red lipstick at night but usually only emphasize one area of their face at one time. They get a good haircut and go into the salon often for a wash and set. I saw them going in just to have it put neatly into a pony- tail. When you are thinking about what to wear in Paris, a tie is not usually necessary unless you are going somewhere formal like the opera on a special opening night. Lots of pockets in your jacket for camera etc. But a black skirt or slacks nice shirt, black shoes will get you almost anywhere. Of course, you can dress any way you like but I did see a family get turned away from a popular restaurant and they were disappointed. If you want to look like a visitor more than a tourist you might consider what to wear in Paris. 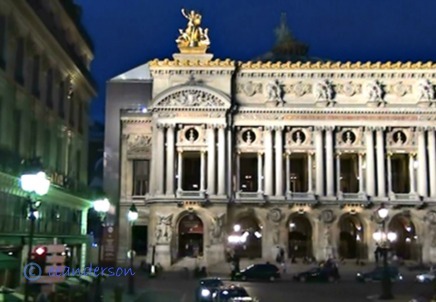 For great information on what to do in Paris. Learn French for free and learn some basic phrases and polite words.